Which is better, a conventional or addressable fire alarm system? The most common types of alarms that businesses use are conventional and addressable alarm systems. Both types of alarm link devices (such as call points and smoke detectors) to a main control panel. The main difference between the two is that with addressable fire alarm systems, you can pinpoint exactly which device has been activated. How do addressable and conventional alarms differ? Every device connected to the addressable system has its own unique address. When a fire is detected, the device’s address shows up on the main control panel, telling you exactly which device has been activated. 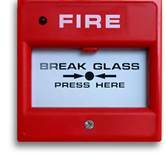 This will enable you to find the exact location of a fire and extinguish them quickly. With a conventional system, there is no way of pinpointing the exact location of the fire. However, by wiring your building into different zones, you can get a general idea of where the fire is. For instance, if you have two floors, you could wire the first as ‘zone 1’ and the second as zone 2. So if a fire occurs in zone 1, you know that the fire is somewhere on the first floor. Addressable alarm systems connect devices using a loop. This is where one wire connects all devices to the control panel. Both ends of the wire loop connect to the control panel. With a conventional alarm, each device will be connected to the control panel via its own wire, rather than a shared one. One end of the wire will be touching the device, and another touching the control panel. Which is the cheaper option for you? Conventional alarm panels cost a lot less to buy but are more expensive to install. This is because each device that is being connected needs its own wire. With addressable systems, one wire loop will connect several devices. This means conventional systems require more wire and more man hours during the installation phase. Additionally, addressable systems have a range of other facilities that can help save money. For instance, addressable alarm panels monitor the air flow through smoke detectors to prevent the occurrence of false alarms, which can be costly to a business. The addressable alarm panel is also the more reliable of the two. This is because the wire connects to the control panel at both ends (see the diagram above). If one end of the loop becomes severed, signals can still be sent to the control panel via the other end of the loop. Loop isolation modules are also used to separate devices on the loop. This means that if one device becomes disconnected, it won’t disable the circuit. With a conventional system, if a wire has become severed, the device will become disconnected. Functionally, the addressable fire alarm unit is superior, which can help prevent costly activities and save time when detecting a fire. It’s also cheaper and easier to install. But in terms of buying price, a conventional system is cheaper, and will meet the functional needs of small premises where a sophisticated system is not necessary. Natasha Sabin is a blogger from Island Fire Protection, a company that specialises in providing fire protection supplies and services. They’re determined to help you keep your business safe. Click here to view more guides on their website. Most fatal fires are started by discarded cigarettes, matches and lighters according to Fire Facts, the London Fire Brigade's comprehensive annual review of fire data. Five housing schemes across South Yorkshire will be fitted with sprinklers, thanks to Fire Authority funding. The schemes have all benefited from money made available earlier this year from South Yorkshire Fire & Rescue Authority's Stronger Safer Communities Reserve Fund.